The brothers Antonio (1431 ca - 1498) and Piero (1441/2 - post 1485) Benci - known as Pollaiolo, because of the profession of their father, poultry (pollo, in Italian) salesman - were two artists of the Italian Renaissance. They were painters, sculptors, engravers and goldsmiths. Antonio was a pupil of Domenico Veneziano, Piero - most probably - of Alesso Baldovinetti. The two brothers often worked together: this fact - already in antiquity - caused confusion and overlap between their two figures. Even today, we do not know for sure who of them is the author of several works. The two brothers were very interested in human anatomy: they studied human body to reproduce - in their work - plasticity and movement, not just the proportions. 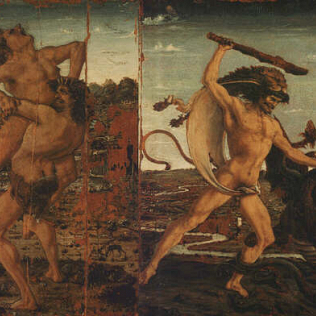 At the Uffizi Gallery there is a room dedicated to the Pollaiolo brothers. In this room the cycle of the Seven Virtues, commissioned to Piero by the Court of Mercatanzia, is preserved. Pollaiolo made six works between 1469 and 1470. The young Sandro Botticelli painted the last one. The Virtues painted by Piero del Pollaiolo are Charity, Faith, Temperance, Prudence, Hope and Justice. The paintings were designed to be hanged very high: for this reason, the figures appear to be partially deformed. Other works by Piero are the Portrait of Galeazzo Maria Sforza and the Altarpiece of the Cardinal of Portugal, painted with his brother. In the room two small tables by Antonio del Pollaiolo are also shown. They represent two of the Twelve Labours of Hercules: Hercules and the Hydra and Hercules and Antaeus. Despite the small size, the two works are rich in detail and the anatomical yield is, according to art historians, extraordinary. The Pollaiolo brothers play an important role in the Italian Renaissance and in the history of art, especially for the dedication to the study of anatomy.